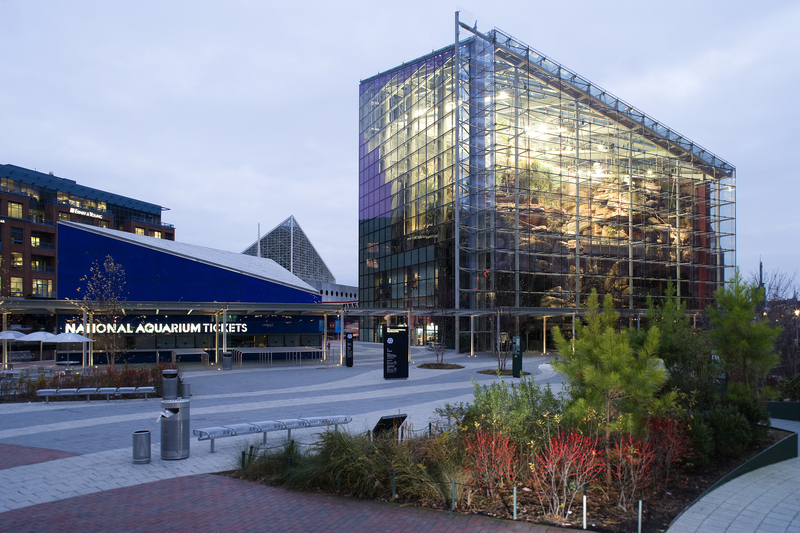 The National Aquarium in Baltimore is one of the world’s finest aquariums, featuring a living collection of more than 17,000 fish, birds, amphibians, reptiles and marine mammals, housed in award-winning habitats. And, it is only a short, 30-minute drive from the Wayside Inn, making it a “must-see” when you visit. Read on to find out why the Baltimore Aquarium is the most popular attraction on the Inner Harbor! The aquarium is located in Baltimore’s famous Inner Harbor, overlooking the Chesapeake Bay. It spans 250,000 square feet and has a water capacity of more than 2.2 million gallons. It is home to more than 17,000 animals from more than 750 species of fish, birds, amphibians, reptiles and mammals living in award-winning habitats. 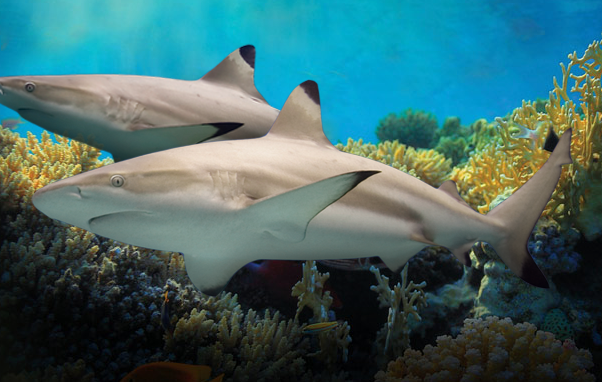 In fact, the brand new Blacktip Reef, a floor-to-ceiling exhibit that replicates an Indo-Pacific reef and features blacktip reef sharks, 700 different species of animals, and an underwater viewing area, recently won the 2014 Association of Zoos and Aquariums’ Significant Achievement Award in Exhibit Design. The aquarium first opened in 1981 and has since grown to become one of the most visited attractions in the area, with more than 1.4 million visitors annually. The aquarium has expanded several times, including in 2005 when it added Animal Planet Australia: Wild Extremes, the only exhibit of its kind in the U.S. depicting a northern Australia river gorge. Named 2008 Exhibit of the Year by the Association of Zoos and Aquariums, this exhibit is home to 1,800 individual native animals representing 120 species, including freshwater crocodiles, turtles, fishes, free-flying birds, and flying foxes. Another popular exhibit is Blue Wonders, in which you’ll explore your connection to water, starting with a video installation created by award-winning photographer/videographer Bob Talbot. The Blacktip Reef is part of Blue Wonders, as are the Aquarium’s iconic bubble tubes. Five levels of exhibits include the mysterious Shark Alley, displays of Maryland’s diverse native aquatic life, an undersea kelp forest, Jellies Invasion, and a brilliant Atlantic Coral Reef, where more than 500 exotic fish swim, including triggerfish, porcupine fish, and hogfish. The largest exhibit at Baltimore’s National Aquarium is Dolphin Discovery, a 94,000-square-foot building that houses a 1.3-million-gallon pool for the aquarium’s eight dolphins. Purchase tickets for one of the Dolphin Immersion Tours where you can experience a private dolphin training and play session. Or simply visit Dolphin Discovery on your own to watch from the stands as the dolphins train, feed and play. Tickets range from $24.95 for children to $39.95 for adults. Discount rates are available for senior citizens and children under 3 are free. The aquarium is open Sunday through Thursday 9 a.m. – 5 p.m., Friday 9 a.m. – 8 p.m., and Saturday 9 a.m. – 6 p.m. It is open every day except Christmas Day. If you’re looking for an exceptional experience, the aquarium also offers an array of Immersion Tours at an additional cost, allowing you to take your experience a step further. In addition to a Dolphin Encounter, mentioned above, you may want to consider a Behind-the-Scenes Tour with Sharks where you can learn about how meals for sharks are planned and prepared, and walk the catwalk above Shark Alley. You can also sign up for a Veterinarian Tour so you can see how the animals are cared for. Certain age restrictions apply for the Immersion Tours. For more info and to order tickets, visit the aquarium website. The National Aquarium in Baltimore’s website has some great tips on how to make the most of your visit. First and foremost, the experts suggest you buy your tickets online. The Aquarium uses timed entry, which allows you to skip the line at the ticket booth and walk right in. Another great tip is to arrive before 11 a.m. so you can experience the animals as they begin their day. If you’re not an early bird, no problem. There are advantages to visiting later in the day (after 3 p.m.), as the aquarium is less busy then. The Wayside Inn in Ellicott City is the perfect place to serve as your home base while you’re in the area. Our bed and breakfast offers six different rooms, and guests enjoy a freshly made breakfast. The Wayside Inn is a short 30-minute drive from the National Aquarium in Baltimore, and it’s convenient to gourmet restaurants and shopping, as well as an array of things to do and see. To learn more about the area, check out our vacation guide.